Imagine a life cloaked in extreme poverty, persistent threats to dignity of life, and deprivation of a decent shelter; that sort of life is certainly in discord with the provisions of the 1999 Constitution of the Federal Republic of Nigeria. 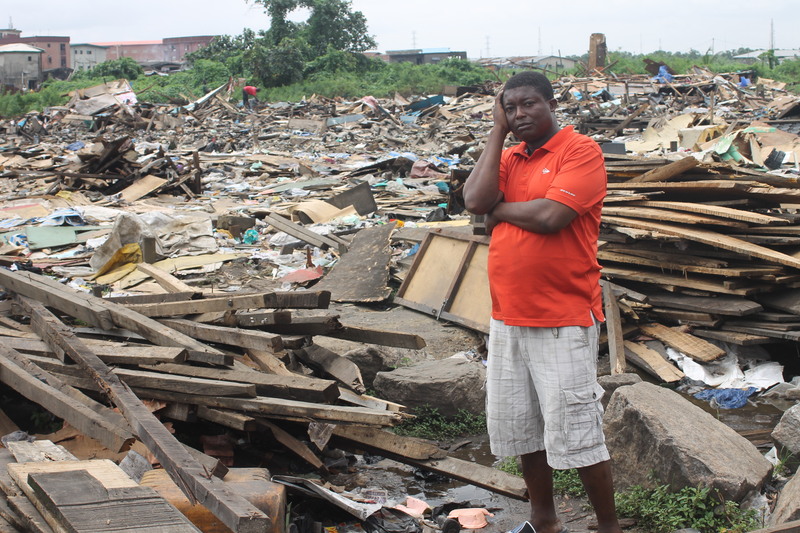 This storyline clearly depicts the situation in which residents of Ajeromi Badia-East, Apapa, Lagos State, have lived for the past 9 months following the September, 2015 forced eviction and demolition of their properties and businesses by agents of the Lagos State Government at the request of the Ojora Chieftaincy family. October 6, 2015 – letter to the Permanent Secretary, Ministry of Local Government and Community Affairs, Lagos State Government seeking dialogue and redress. October 7 – letter to the Permanent Secretary, Ministry of Intelligence, Lagos State Government seeking dialogue and redress. October 9 – letter to the Managing Director, Railway Property Management Company Limited seeking intervention, and data to found the evictees claim to the demolished property. October 28 – letter to the Permanent Secretary, Federal Ministry of Lands, Housing and Urban Development seeking intervention, and data to found the evictees claim to the demolished property. October 28 – letters to Professor Bem Angwe (Executive Secretary, National Human Rights Commission) and Rachid Benmassaoud (World Bank Nigeria Country Director) seeking intervention. November 3 and 6 – letters to the Permanent Secretary, Ministry of Local Government Affairs, and the Special Adviser, Communications and Communities, Ministry of Local Government and Community Affairs, Lagos State Government requesting protection of evictees from harassment by agents of the Ojora Chieftaincy family. January 26, 2016 – letter to Special Adviser, Communication and Communities, Ministry of Local Government and Community Affairs, Lagos State requesting fulfillment of commitment to provide welfare package to evictees in December, 2015; and meeting schedule. May 12 – letter to Special Adviser, Communications and Communities, Ministry of Local Government and Community Affairs seeking urgent and holistic action to remedy the prolonged travails been borne by evictees. It is sad to note that despite the series of correspondence and meetings held with the designated government representatives and stakeholders, there is still no projection of justice for the evictees in sight. Topping the reasons for this delayed justice is the failure of the Lagos State Government to use the alternative dispute resolutions mechanism – Community Conflicts Resolution Forum – it had put in place to engage the evictees meaningfully, and ensure that the violations to their rights are redressed. Determined to get justice for the evictees, S4C has now approached the Federal High Court in Lagos for legal redress vide a fundamental human rights action filed on May 19, 2016 in Suit No: FHC/L/CS/683/16. With additional legal support from Nigeria’s leading human rights advocate, Ebun Adegboruwa, Esq., S4C is also finalizing processes to appeal against the purported judgment of a High Court of Lagos State, which was the basis of the September 2015 demolitions. In that judgement, the evicted residents were neither parties to the suit, nor were given the opportunity to have their interests in the property determined. 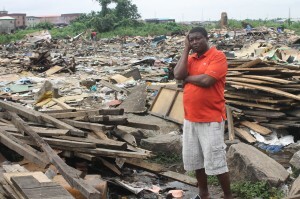 A declaration that the forced eviction and demolition of the Applicants’ residential houses, business premises, schools at Badia East, Ijora, Apapa Local Government Council of Lagos State without adequate notice, consultation,and the provision of alternative accommodation, contravenes Sections 34, 36(1), 43, 44 of the 1999 Constitution (as amended), Article 5 of the African Charter on Human and People’s Rights (Ratification and Enforcement) Act and Article 17 of the Universal Declaration of Human Rights. A declaration that the continuing harassment, detention, including threats of arrests and physical harm, by the respondents is a breach of the applicants’ fundamental rights as guaranteed under section 34 and 35 of the Constitution of the Federal Republic of Nigeria, and Articles 5 and 6 of the African Charter on Human and Peoples Rights (Ratification and Enforcement) Act. An order of injunction restraining the Respondents from continuous threats of arrests and evictions, in violation of their fundamental rights to human dignity, liberty and property. Undeterred by funding challenges, S4C is also set to file for a restraining order to stay further development (construction of buildings on the land started in 2016) on the land till the grievances of the displaced citizens are resolved. On the other hand, the plan to appeal the judgment of the State High Court is presently stalled due to the mysterious inability of staff of the High Court to locate the file records. The records of court proceedings are prerequisites for filing the appeal. Because the evictees were not being parties to the said suit, they have kept no personal record of the case files. Widespread jubilation erupted in the community when news of the latest court action filtered in. Notably, Pastor Olatunde Aworetan and Mr. Seinde Ebiesuwa (representatives of Ajeromi Community, Badia-East) expressed gratitude to S4C for the unrelenting role it has played in helping them to get justice. Just like most community representatives, they are hopeful that justice would be served through the courts.